NORMAN, Okla. -- Nineteen years ago, Javier Flores was a wide-eyed, talented freshman out of Broken Arrow, Okla., beginning his rookie campaign as the backup to All-American Rich Hills at shortstop for the University of Oklahoma baseball program. By season's end at the 1994 NCAA College World Series in Omaha, Neb., he was OU's starting catcher and chased down a swinging bunt by Georgia Tech star backstop and future MLB All-Star Jason Varitek, firing a throw down to first base to clinch the program's second national title. 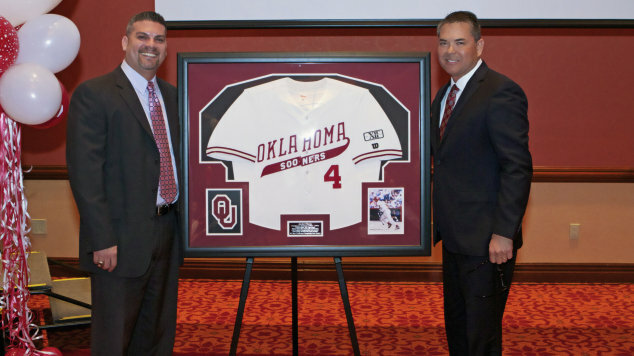 The 2013 Sooners, who feature 12 freshmen, are hoping to capture some of that '94 magic, as the program honored the career of Flores (1994-97) and celebrated the start of a new season Saturday at the 10th Annual Diamond Dinner, held at the Embassy Suites. "The banquet is always a great time of year," said OU head coach Sunny Golloway. "There's always going to be a lot of excitement from the players and the coaches, but when we see that energy translated over to our fans, our families and so many of our boosters that have followed our program, that's really exciting to me." OU officially lifted the lid off of the 2013 campaign Friday as team practice opened with an intersquad scrimmage at L. Dale Mitchell Park. Oklahoma begins the season with a four-game home set against Hofstra Feb. 15-17. Fans can purchase tickets online on SoonerSports.com or by calling the OU Athletics Ticket Office at (800) 456-GoOU. Flores, a three-time All-American, is the 17th former Sooner to be recognized at the banquet, which started in 2004. "It's special coming back to OU, a university I love so much" said Flores. "Being honored like this in front of the team and my family, it means a lot." Flores posted a career batting average of .344 with 20 home runs and 154 RBI as a four-year starter at backstop. He ranks third in OU history with 59 doubles, fifth with 768 at-bats, sixth with 264 hits, seventh with 219 games played and eighth with 84 extra-base hits. In addition to the national title in '94 and another CWS appearance the following season, Flores helped lead the Sooners to their first Big 12 Conference championship in '97. He garnered All-America honors three times from the National Collegiate Baseball Writers Association (1995 First Team, '96 & '97 Second Team). He was also honored twice from Collegiate Baseball Newspaper ('95 Second Team, '97 Third Team) and once by both Sporting News ('97 First Team) and the American Baseball Coaches Association ('97 Third Team). He was a three-time first team all-conference honoree. Flores was named to the National College Baseball Hall of Fame ballot last February. Flores was selected by the Oakland Athletics with the 305th pick in the 10th round of the 1997 MLB Draft and spent five years in the minor leagues. He was also drafted by the Kansas City Royals with the 229th pick in the eighth round of the 1996 MLB Draft. "It touches my heart because I coached him and helped recruit him here," said Golloway of Flores, whom he mentored as an assistant coach on the '94 squad. "Javy was my guy, and I stayed with him, and he ended up being a star. It's kind of funny that he's honored and we have so many talented freshmen on this year's team. What a great person for those guys to look up to, a guy who was able to step in and start and lead us to a national title as a freshman." Golloway also previewed the season in between videos which highlighted each class of the 2013 squad. For the third straight year, the banquet featured the Mitchell Whitaker Award, which is named after the late Mitchell Whitaker, a special friend of the baseball program who passed away on September 27, 2007 after battling Leukemia, and celebrates the qualities he exemplified. The qualities include being a teammate that is mentally tough, hard-nosed and always put the team first. Junior right-handed pitcher Jonathan Gray was honored as the 2013 recipient. "That award means everything to me," said Gray. "It's really special, and I'm really honored." Senior captain Jack Mayfield won the inaugural award in 2011, and former OU southpaw Jordan John won last year. 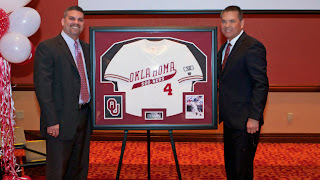 The Sooners are seeking to make another run at the NCAA Men's College World Series in 2013 under Golloway's watch. Oklahoma posted a 42-25 mark last season and reached its third Super Regional in program history. OU is looking to make its sixth straight appearance in the NCAA Tournament and 36th overall appearance. The Sooners have reached the CWS on 10 previous occasions, winning national championships in 1951 and '94. Oklahoma's pitching staff is anchored by a pair of junior aces in southpaw Dillon Overton, a 2012 All-Big 12 Honorable Mention pick, and Gray, who were both named to the 2013 Louisville Slugger Pre-Season All-America Second Team, as selected by Collegiate Baseball Newspaper. Senior outfielder Max White, an All-Region Second Team pick by the American Baseball Coaches Association in 2012, leads the offensive attack alongside Mayfield, an All-Big 12 Tournament Team and NCAA Charlottesville All-Regional Team selection last season. "Our captains are doing a great job of leading, our middle guys are like Sergeant-at-Arms in the way we're supposed to do things, and we have a bunch of mature freshmen who are right in line, doing what they're supposed to," said Golloway. "It's been a blessing so far. Expect big things from the Sooners." OU enters the 2013 season ranked No. 14 by Collegiate Baseball Newspaper, No. 16 in the USA Today Coaches' Poll, No. 19 by Baseball America and No. 20 by Perfect Game.